Ingrown hairs are hairs that have curled round and grown back into the skin. They produce raised red spots, which can sometimes become infected and turn into painful, pus-filled sores. Ingrown hairs can be itchy and embarrassing, but they often go away on their own without doing anything. Anyone can get ingrown hairs, but they tend to be more of a problem in people with coarse or curly hair. Ingrown hairs have usually grown out of the skin, curled back round and re-entered the skin. Some curl back into the hair follicle – small cavities in the skin that hairs grow out of – without even exiting the skin. An ingrown hair can occur when the hair follicle becomes clogged with dead skin cells. This forces the hair inside it to grow sideways, which is much more likely to happen if the hair is already curly or coarse and it's recently been shaved. Ingrown hairs can be a particular problem in areas where you may shave – such as the beard area in men, and the legs, armpits and pubic area in women. In these places, the hair that grows back has a sharper edge and can easily poke back into the skin. Ingrown hairs look like pimples in the skin, and sometimes you can see the hair trapped beneath the skin. The spots can be filled with pus. If possible, you should leave ingrown hairs for a while as they may disappear without you having to do anything. Don't pick or scratch an ingrown hair as bacteria can enter the small wound created, increasing your risk of infection. It can also cause scarring. You should also avoid squeezing the spots because it can damage the skin and lead to infection. If an ingrown hair is near the surface of your skin, you could use a sterile needle or tweezers to gently tease it out. However, don't dig for the hair if it lies deep below the skin's surface. Men who are prone to getting ingrown hairs around their face may find it best to grow out their beard. Longer hairs aren't as sharp at the ends, so are less likely to become ingrown. The hair follicles of ingrown hairs can sometimes become infected and inflamed. This is known as folliculitis. The hair follicles will swell into pus-filled spots, although pus doesn't always mean there's an infection. 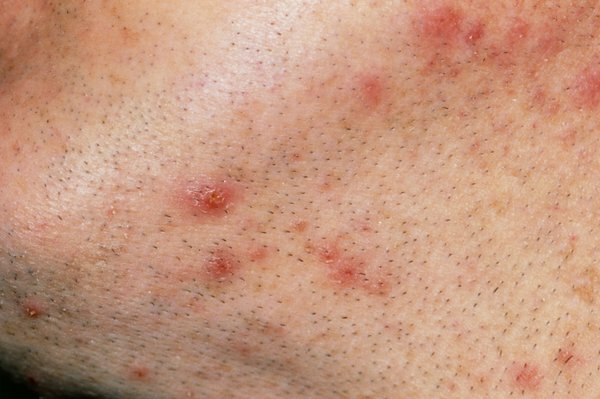 Again, mild cases of folliculitis often clear up without treatment, so try not shaving for a few days and see if it gets better. You could also try dabbing a mild antiseptic, such as tea tree oil, on to the affected area. See your GP if the spots don't improve and are bothering you. If one particular spot is a problem, your GP may be able to release the ingrown hair using a sterile needle. Antibiotics are usually only needed if the skin is severely infected with pustules and abscesses. The simplest way to prevent ingrowing hairs is to let your hair grow freely without shaving it. You may want to try this for a brief period if you need relief from particularly bad spots. Other hair removal methods may be less likely to result in ingrowing hairs. For example, instead of shaving your legs, you may want to try depilatory creams, electrolysis or laser removal. See your GP if you're unsure. The above links will take you to more information about these similar-looking skin conditions.